The history of Zejtun, in the Mediterranean island of Malta, goes back thousands of years, to prehistoric times. There are many historical remains in Zejtun, from the mysterious "CART RUTS", to Roman Villa remains, to the ancient temple of Juno, which itself was built on the site of an older, prehistoric temple. When the Apostle St. Paul was shipwrecked in Malta in A.D.60, he converted the natives to christianity from paganism (at that time, the Maltese were Roman subjects - see the Acts of the Apostles in the Bible). St. Paul set up shop, so to say, in the opposite part of Malta. By the time he came down to Zejtun to preach the faith, the local pagans didn't want to hear about it, so, the story goes, they stamped their feet to drown out his words (funny, but this tactic (they used church bells, whistles and noise-makers) was used by the religious groups and the Church in Malta during the tumultuous '60's in Malta to drown out the words of MLP politicians during public corner meetings). The local pagans must have stamped their feet so much that they ended up, so the story goes, with FLAT FEET! Strange but true, a good number of Zejtunians, yours truly included, do have flat feet! Most Maltese towns and villages have "nicknames" for their inhabitants. For example: Hamrun (pronounced "HUM-roon") people are known as "tas-sikkina" ("those who use the knife", hmmmm); Birkirkara (pronounced "Beer-kir-KA-rah) "ta' sormom catt" ("flat-assed"); etc. Zejtunians are known as "ta' saqajhom catta", or "flat-footed". Though Zejtun is a small village, in a small island, it is made up of even smaller villages and hamlets that melded with each other throughout the ages. One such hamlet was called BISQALLIN (pronounced "BEESK-ul-leen", meaning "sons of the Sicilians" or "Sicilians' hamlet", depending on the interpretation of Bisqallin (Birsqallin)) Other hamlets were called HAL-GILWI (pronounced "hal-JILL-we"), MISRAH STREJNU (pronounced "MISS-rahh STRAY-noo"), and others..
IS-SALIB TAL-PJAZZA (pronounced "is-sah-LEEB tull-PYAT-suh"), meaning "The Cross in the Village Square", is located, you guessed it, at the entrance of the main square, the one in front of the church (St. Catherine's). 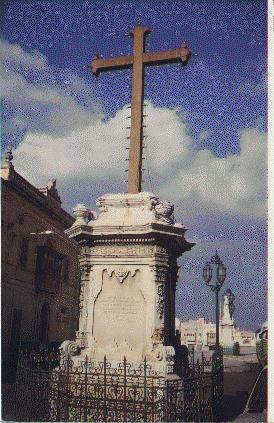 This cross was "captured" by the Zejtun militia from the square in front of the St. Liberata Capuchin convent, during a raid on a French garrison in the three cities on the 5th of September, 1799. The Zejtun patriots were aided by others from the neighboring village of ZABBAR (pronounced "zub-BAR"). An inscription in Latin reads: "This cross that you see erected before you and that used to be in the Capuchin Convent in the town of BIRGU (pronounced "BIRR-gooh"), during the period of the French Siege of 1800, was taken from the hands of the enemy by this village's inhabitants, driven by their good will and their patriotism, and was here erected."